To be a leader is to influence others. Public leadership theory focuses on how to inspire people to share a vision of transformational change and act collaboratively toward its realization. For anyone in a position of responsibility in public administration, leadership also entails exercising influence in a more direct and routine way. Few who assume such important responsibility have had the benefit of an immersive leadership development program that teaches serviceable guiding principles and effective methods. There is a fertile source of learning about direct leadership within public service—the military. Military training, mentoring and assessment aim at developing leaders who can earn trust and inspire high performance in any organization. Today, the military is rarely mentioned in public administration leadership development. But this separation is not an organic part of American government. Almost all of the Founders had extensive military experience. They applied their military experience when they defined leadership roles in the branches of civilian representative government. Everyone knows this about George Washington, who was both the most highly regarded military commander and the model for the nation’s chief executive. Much has changed. Since Dwight Eisenhower left office 55 years ago, only two presidents experienced combat: John Kennedy and George H.W. Bush. Military experience is increasingly rare in Congress, the judiciary and state capitols. So is any personal familiarity with military service. As columnist and former Marine Mark Shields once said in his Washington Post column, “No Washington dinner party guest–liberal or conservative, Democrat or Republican–personally knows any one of the 1.8 million enlisted Americans serving in our armed forces.” Without a personal attachment, impressions about the military are impaired and the value of the experience is overlooked. The same gap exists in how public leadership is taught. Academic programs rarely have someone on the faculty with military leadership experience. The scholars who write the textbooks are from a culture that distrusts what they perceive as rigid and authoritarian. They have urged enlightened rejection of the military as a useful resource for public leadership. For instance, in 1960, in his influential book The Human Side of Enterprise, Douglas McGregor said, “If there are universal principles common to all forms of organization, it is now apparent that they are not the ones derived by classical theorists from the Church and the military.” Today’s students are likely to encounter a persistent mistaken perspective that equates military leadership to a belief system rather than the nuanced and evolving approach that most veterans experienced it to be. The military teaches immutable lessons such as the importance of being trustworthy, communicating well, keeping calm under pressure, developing teams, and making the best use of limited resources. Military officers are expected to cultivate traits and learn principles that are based on human behavior and apply them in myriad contexts such as managing supply chains, organizing civil administrations and responding to emergencies. 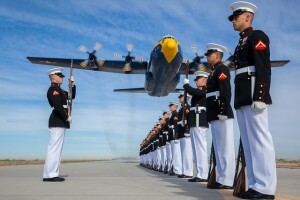 They learned leadership serving beside those for whom they were responsible and witnessed how demeanor and actions affect performance and morale. This experience rarely can be found elsewhere. The military teaches that leadership always must be adapted to the circumstances and this is certainly true when veterans later take on responsibilities in civil organizations. But effective leadership is not fundamentally different within or beyond the military. Everyone can learn from approaches that have tested, as can be seen with just a few examples. The military urges leaders to want decision making authority, but connects that privilege to being accountable for results. Leaders are obliged to reflect on decisions that were made so better decisions can be made in the future. Applying this principle in practice can be difficult in a modern public organization in which responsibility is diffused and there are always external causes to which difficulties can be attributed. The military emphasizes personal responsibility to mentor others’ leadership development. Performance evaluations are explicit about this duty. Although the value of mentoring is acknowledged within public administration, its occurrence is mostly haphazard. Leadership training rarely is correlated with the organization’s mission and performance. All public service leaders will benefit from a better understanding of the military experience. To bridge this gap the UNC MPA program offers a unique course, Military Leadership and Public Administration, in which students study leadership as taught and demonstrated in the services and how it translates to other public service. The subject matter includes readings about military leadership, case studies in military and civil environments, and the perspectives of guest speakers serving as commanders or working with veterans. Educators and public administrators in practice also can tap into many currently available resources that are used in military leadership training. These include the military’s manuals that have well-articulated principles and examples of their application, such as Army Leadership ADRP 6-22 and Leading Marines MCWP 6-11. There also are excellent books that veterans have written about lessons that can be derived from military experience, such as Character in Action: The U.S. Coast Guard on Leadership, by Donald T. Phillips and James M. Loy. There is much to be gained from working to overcome the mistaken assumption that public administration has nothing to learn from the military. Author: Charles Szypszak is a professor of public law and government at the School of Government at the University of North Carolina at Chapel Hill, a former captain in the U.S. Marines, and author of the book, Military Leadership Lessons for Public Service. He can be reached at [email protected]. I quite agree. Excellent addition to your MPA program. To a very great extent, military service has been politicized to the point that many in academia are afraid to touch the public administration aspects of the military institution. This is unfortunate. We must work to demonstrate that military service and military leadership are not “owned” by one part of some ideological spectrum. Indeed, the “common defense” belongs to all of us.